The 20th Annual Expect Miracles East Coast Classic lived up to its reputation yet again as industry event of the year. 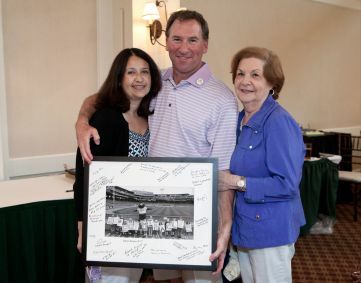 With Foundation Sponsor Interactive Data Corp. leading the way, members of the finance community gathered on Thursday, June 12th to raise funds for a cure at Pinehills Golf Club in Plymouth, MA. The sun shone bright as players checked in and collected their gift bags, complete with a certificate for a custom fit shirt courtesy of Blank Label. Several Miracle Maker Leadership Council members were in attendance, and wore their pins proudly on the links. Out on the course, golfers had the chance to make a hole-in-one and ace their way to Bermuda courtesy of Gosling’s Rum. As the tournament came to an end, players gathered in the clubhouse for hors d’oeuvres and Dark ‘n Stormy cocktails as they awaited the spectacular Helicopter Ball Drop. With Emcee Jon Meterparel, the 20thAnniversary got off to a great start. Founder & Chairman Frank Strauss thanked this year’s sponsors and presented two special awards to Expect Miracles supporters. Nick Nichols from Keane was presented with the Expect Miracles Award and Lisa Onorato of J.P. Morgan was honored with the C.J. Award. Jon Meterparel kicked off the Live Auction with some amazing packages including Beyonce tickets, a Red Sox Grounds Crew experience, and more. Chief Development Officer Frank Heavey introduced Tara Daniels who described how her diagnosis of Acute Lymphoblastic Leukemia (A.L.L) impacted her life at school and home. Tara emphasized the importance of events like Kid’s Golf Day at Fenway Park. She said children miss out on so much while undergoing cancer treatment, and it is important to give them a chance to “just be a kid” and make memories with family members. When her moving speech came to an end, Frank Heavey rallied the audience to donate to Kid’s Golf Day and the support was overwhelming and inspiring. If you didn’t get to make a donation at the East Coast Classic, click here to help us send children impacted by cancer to Kids Golf Day at Fenway Park. Frank Strauss honored a select group of individuals for their 20 years of continuous support toward the Foundation presenting each of the early supporters with a special gift. Frank expressed his gratitude toward all of his supporters and spoke the vast progress the Foundation has made since the first Classic in 1995. To culminate the celebration, everyone assembled for a celebratory group toast courtesy of Sam Adams. Contest and prize winners were announced, including the featured Opportunity Drawing prize of a trip to Jamaica courtesy of Jamaica Tourism and partners. The success of the East Coast Classic grows every year, and would be impossible without our loyal supporters. From longstanding advocates to new volunteers, the continued growth of Expect Miracles Foundation has helped build a national movement to rally the financial service industry in the fight for a cure. Thanks to all of our sponsors, donors, participants, and volunteers for helping us touch the lives of countless individuals affected by cancer. We hope to see you all next year! Don’t forget to join us on the West Coast on October 23rd!